It’s barbeque season in Tahoe, and Uncorked wine shop in Squaw Valley is a place to go for some grill-pairing wines. Opened two years ago, this lovely shop has attracted a loyal following who enjoys the constantly changing wine-by-the-glass menu. It’s also become a destination for pre-wedding “Meet and Greet” parties. Uncorked features hard to find wines, the crème-de-la-crème produced by smaller boutique wineries. And it’s known for a large selection of affordable wines that fit the wallet of recession-strained consumers. In their inventory, sixty percent of their wines originate in California, twenty percent in the Northwest (Washington, Oregon, and they always have Oregon pinots on hand! ), and twenty percent are international wines. In its cozy cellar area, surrounded by racks of wines, you can sit at an intimate table for four, and sample wines (3 tastes for $10) and enjoy a fresh cheese plate too. Or, take your tastes outside at the umbrella-shaded tables on their patio. Uncorked sponsors winemakers many Fridays and Saturdays, pouring their own wines from 4 to 7 p.m. You can find the complete listing of events on Uncorked’s website, http://www.uncorkedatsquaw.com/. Recently featured were the winemakers of Arbios Cellars and Praxis. Arbios focuses on a single Bordeaux-style red wine, made from 100 percent Cabernet Sauvignon grapes grown in in the Alexander Valley of Sonoma County. Praxis is their second label, priced at about half the limited-product Arbios wines. Both wines emphasize terroir with more than half made from a single vineyard. Barbeque lovers will find dozens of wines to pair with their grilled delights, but we tasted four that were simply wonderful. The first two, from Ramian Estates, were a recent selection for the Uncorked wine club. Ramian, Linden Hills vineyard, 2006 Grenache Rouge (Lodi) is a small case production wine, with only 276 cases made. It is light to medium body red, featuring light tannin, and strawberry fruit is dominant on the palate. This Grenache is certainly drinkable with or without food, but Uncorked’s Britton Burnett suggests that it would pair wonderfully with barbeque pork, grilled pork loin, grilled or smoked chicken, and ribs. A great summer wine, styled after the Grenache wines of Spain, you’ll enjoy the fresh characteristics or this wine from the Linden Hills vineyard, situated in the southern hills of Lodi appellation. This vineyard is the perfect spot for growing Red Grenache. $18 bottle, 14.2 % alcohol. It’s also currently on Uncorked’s wine-by-the-glass menu. The Ramian, HBV Ranch, 2007 Viognier features an aroma with a perfumy hint of blossoms, honeydew and apricots. This Viognier is creamier on the palate, and should pair nicely with lighter dishes, white fishes like halibut. Or, as the saying goes, “It pairs well with a beach on Lake Tahoe, if you have it”. Only 130 cases of this Viognier were produced. $20 bottle, 14.4 % alcohol. Thinking of a nice grilled steak? Then think about this Petit Sirah from Twisted Rivers, 2006, Clarksburg. It is a full bodied red, nice tannin structure, nice berry. Duke Heringer, the owner of Twisted Rivers, is a good friend of Uncorked. Aged in French oak for twenty months, only 230 cases were made of this wine. $26 the bottle, 14.5% alcohol. How about the shrimp on the barbee? You might want to choose the Sancerre Vieilles Vignes 2006 from the eastern part of France’s Loire Valley. This Sancerre is a bit earthy, while still being refreshing, crisp, and citrusy. $28 the bottle, 12.5% alcohol. Uncorked is open from noon to 8 p.m. every day. Located at 1750 Village East Road, in Olympic Valley, California, you will find them in the Village at Squaw Valley, across from the clothing shop Atlas. Call 530 584 6090 to check on availability of the wines noted in this column, as they are from small wineries and sell quickly! For more information on dining and the wide range of activities around Lake Tahoe, see the online version of The Tahoe Weekly. This article appeared in my column "It's Grape" in June 2009. 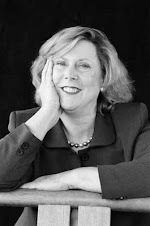 These are great tips for successful wine salesmanship – but there may be only one Brian Ellis. If there are more, Costco is hiring. Blessed with a remarkable sense of smell and a memory for the essence of every wine he’s ever tasted, Brian is a cornerstone of this store. When he joined Costco a few years ago, he managed to imbue all the other Castleton managers and staffers in the store with his enthusiasm about wine. I feel privileged to have spent 90 minutes with him today. And Costco is probably glad too. I came in determined to buy only two more bottles for my Indianapolis-brother’s wine rack. Six bottles later, I am really happy. This adventure with Brian at Costco started out when I went to update my membership card and figured out it was easier to do that while visiting Indianapolis than to wait in a line of 80 in San Francisco. Mark, the membership services guy at the counter, showed the usual Midwestern openness and asked what brought me to Indy. I told him briefly about the videotaping I’d done for the Hoosierwinecellar blog and the plan to go to the Indy International Wine Competition event. Mark brightened, and said, “Oh, too bad Brian is not here today. 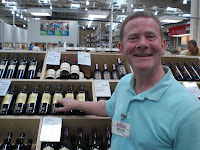 You really ought to meet him.” Mark explained that Brian was a wine steward at the store. Wine steward –AT COSCTO? Business card at the ready, I asked Mark to please have Brian call me. We met at that fine dining establishment, the white formica tables in front of the “Polish Sausage and Soft Drink, $1.50” sign. Trained as an electrician, Brian said he switched careers after an accident on the job many years ago. Deciding what to do was easy, since he discovered fine wine in the late 1970’s. He’s been drinking and learning about wine, and collecting it too, for almost 25 years now. Brian’s first wine industry job was as a wine salesman for Midwest Wines, a promoter. He did an event at the Castleton Costco, and sold so much wine during the event that the store manager asked him to consult with them. After doing that for a few years, he signed on full time in 2008. Brian has two secret weapons: his outgoing personality, and his wine memory. “All I have to do is taste a wine once, and I can remember it,” he says. His eyes got that distant sensory-experience look, as he recalled the 76’ legendary German Rieslings of his early wine loving years. 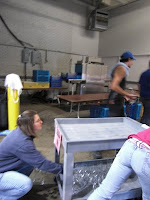 He does some home winemaking in order to keep learning about the process. Along the way, he found this out: “Most winemakers decide in advance what the wine will be like. Then they just help nature along.” Brian tries to make truly classic vinifera style wines using what Indiana has most of: fruit. His best so far is a cherry/plum blend where he said the fruit simply transcended itself. He thinks that adding sugar to a wine after the fermentation is done is cheating, and he won’t do it at home and he won’t recommend a commercial wine where that’s been done. 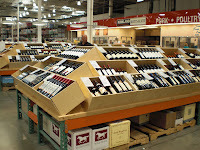 Recommending wines to customers at Costco has its limitations. 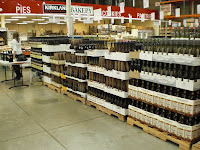 Those limitations have to do with the constraint on numbers of wines that the regional buyers supply to the stores. But after a few years of steadily nudging the office in Chicago to stop tilting toward California wines so much, Brian has been able to secure a good selection of European, South American and Australia/New Zealand wines, even the occasional South African wine. No customer of Brian’s ever walks away disappointed! What’s the worst thing about working at Costco, I asked. “Walking through the detergent section,” Brian replied. HE MADE ME BUY THEM, HONESTLY HE DID….! I have these wine conversations with my brother the doctor every evening when I visit him. I cook; it’s my way of repaying his hospitality since his busy physician’s schedule in Indianapolis doesn’t give him much time to visit me in California. I’m not a great chef, but he’s grateful for a hot meal at the end of his 11 hour days. He’s been pleased to see a glass of wine at his place on the dinner table, and he usually says the same thing as he sits down: “I hope you didn’t pay more than $7 a bottle for this, it all tastes the same to me.” This week, thanks to Brian’s help, he’s learned differently. I think. As my sibling, he’d never confess it, if so. I was wrong. Make that 3064 wines. From all over the world! The tasting and judging action at the Indy International Wine Competition surely qualifies for Seinfeld’s Feats of Strength category. There are many unsung heros in the wine judging world, and many untold stories, and more than a few rude comments about our favorite elixir. But as a “guest judge”, let me give you a guided tour to what’s behind the curtain. When you enter this hangar-like Blue Ribbon Pavillion at the Indiana State Fairgrounds, there is a barrier reef that you must navigate. The long long table contains gatekeepers who make sure you are who you say you are. 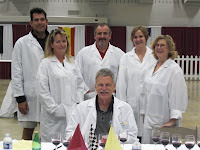 Once you verify that you are in fact judge-worthy (wine writers and bloggers are judge-worthy), then Jeanette Merritt, the marketing specialist for the Indiana Wine Grape Council/Purdue University, leads you to the lab coat rack. A lab coat! Not since I toured the re-industrialized brewery at Kirin in Yokohama have I had a chance to wear a lab coat! But it’s a good thing. So many wines. So many colors. So much spitting. A lab coat is a good thing. The advance preparation of the flights, based on organizing wine by varietal and a number of other factors, takes weeks. Wines have been arriving at Purdue for months. They’ve been catalogued and entered into a program designed by Phil Rawles, a professor in the Department of Computer and Information Technology at Purdue. 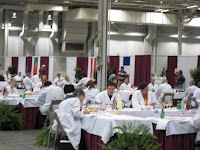 At the end of this competition, the program takes in the information from the judging sheets and determines the award-winning wines and the overall best-of-show. Back out at the front of the hall, 16 panels of judges each are presented with flight after flight of wines, each wine in a glass that has only a number hand-written in marker on the base. The head judge at my table was Steve Somermeyer, assistant winemaker at Chateau Thomas Winery (Plainfield, IN – near Indy). 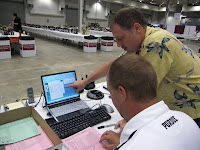 Although each judge’s opinion is considered equal in determining the final score for a wine, Steve can call for a further consideration of a scoring. Of the 32 wines that I tasted (12 Sangiovese, 13 Nortons, 7 Cabernets – some of which were vineyard designates) , only 3 wines were re-considered. 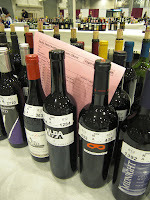 The judging sheet guided us to consider the following attributes of each wine: clarity, color, aroma, taste, aftertaste. The competition used to award points for cellarability, but doesn’t do that any longer. We were told the vintage of each wine, but nothing else. After each attribute was considered, a numerical score was tallied, and the results could be “No Medal” “Bronze” “Silver” and “Gold”. (At first this seemed overly generous to me, but an amazing number of No Medals are awarded, so consumers can in fact rely on the guidance suggested by the awards.) At the end of each flight, each judge is polled for their opinion, and the average score is used to determine the award. Or the no-award. As interesting as this all was, it is important to give a tip of the hat to the unsung heros. Those are the folks in the “Pit Cru” who poured all the wines to be tasted, and those others who washed over 15,000 dirty wine glasses. Without them, no awards. None at all. 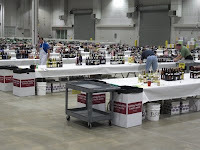 The Indy International Wine Competition began in 1973. The 2009 competition judged wines from 42 states and 10 countries. 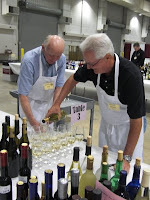 82 wine experts – winemakers, wine journalists, wine educators, wine marketers, and knowledgeable wine consumers -- each judged approximately 120 wines per day. In a few days, we’ll know the results. I’ll post a link and there will also be a guest-blog by a head judge that’s a what-to-buy guide. Stay tuned! Thus was born this casual wine bar with an orientation toward serving up not only good food and wine but also good local music. Located at 599 North Lake Blvd in Tahoe City, there’s live music every Friday night, but a unique event is the Tuesday night “Open Mike Night” which showcases local musicians. When I went on a Tuesday to hear a local jazz band play, the place was packed, but everyone at the bar scooted a bit closer together, with a welcoming and instant familiarity. The wine list is a big attraction, featuring a broad selection of affordable wines, with small plates that pair wonderfully. Recently redecorated to accommodate more guests and a robust kitchen, you’ll enjoy going to the Fat Cat to pair these (and more) wines with these (and more) small plates. A 2007 Sonata from Nevada City Winery is a blend of Sauvignon Blanc and Chardonnay (68% and 32% respectively) that play off of and balance each other in perfect harmony. Only 330 cases of this wine were produced. On the palate, the wine shows a bit of citrus with fruit overtones but not too sweet. For a fruit-forward wine, it is crisp and dry. 14.2% alcohol. $7 glass/$20 bottle at the café. Carolyn paired the Sonata with Thai lettuce wraps, featuring chicken, tofu and pine nuts sautéed in spicy Asian sauces. This small plate dish can also be made with tofu only, for the vegetarian crowd. The 2007 Chardonnay from McManis Family Vineyards located in Ripon in California’s northern interior is light, fruity, not too oakey and not too buttery, with abundant aromas of pear, mango and tropical fruit. Grapes for this wine came from McManis’s River Junction vineyards at the confluence of the San Joaquin and Stanislaus Rivers. 13.5% alcohol. Paired with a plate of roasted shrimp that are a bit spicy with lots of garlic and red chili flakes – perfect! The wine is $7/glass, $19/bottle at the café. The Italian 2007 Vallevo Montepulciano d’Abruzzo is a straightforward dry red wine with a smoky, blackberry taste and sweet medium tannins. Made entirely of the Montepulciano grape from the region of Abruzzo. !3.5% alcohol. $6 glass/$17 bottle. It was well paired with the café’s pasta pomodoro, and would go well with the café’s entrée sized meat sausage lasagna, “a lasagna that every guy in Tahoe City is hooked on,” says Carolyn. Another good red wine is the Lang & Reed 2007 Cabernet Franc. The winery is located in St. Helena, CA, and grapes for this 100% Cabernet Franc are sourced entirely from California’s north coast. I found it to have a fantastic nose, and would give it my highest personal ranking, which is “Yummy!” A bit of pepper on the mid palate, a fresh-herb taste mingled with black cherry. Silky tannins add to the rich taste; it is eminently drinkable! $12/glass, $35/bottle. It paired beautifully with the dinner special at the Fat Cat Café, which was a beef filet. The newly renovated Fat Cat Café offers a fantastic selection of wines by the glass. The kitchen features an excellent assortment of small plate offerings including sliders, sweet potato fries, homemade soups and many other tasty menu items. Located at 599 North Lake Blvd in Tahoe City, it is open daily 11AM- 10PM. Phone 530-583-3355, but reservations not required.